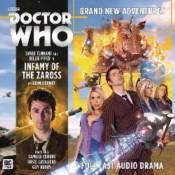 Starring David Tennant as the tenth Doctor with Billie Piper as Rose and Camille Coduri as Jackie. When Jackie Tyler takes an away day to visit her old friend Marge in Norwich, she finds her holiday immediately interrupted in the worst way possible - an alien invasion! The infamous Zaross have come to take over the Earth. Or have they? After Jackie calls in the Doctor and Rose to deal with the menace, it soon becomes clear that this is a very unusual invasion indeed. The Doctor is about to uncover one of the most heinous crimes in the history of the galaxy. And if he can't stop it an awful lot of people are going to die.